Which are good stocks for investment? Which Good Stocks I should buy? Well, it is most difficult questions to answer. Only two people can answer these questions. Either you or your stock market analyst. If you need to answer this question you need to carry out research and study. Your stock market analyst can answer this question easily. Which stock mutual funds are buying? Which stocks are favorite of stock experts? Where FII is putting money? Nowadays it is very easy to get this information. You just need to Google. Today morning, I have come across one similar piece of information on Moneycontrol Website and I can’t stop myself from sharing information given in that article with you. The article given in Moneycontrol website talks about 30 trusted stocks where FII, Mutual fund, and LIC is making an investment. From that 30 stocks, I have shortlisted 20 Good stocks. The details of 20 Good stocks are given below. 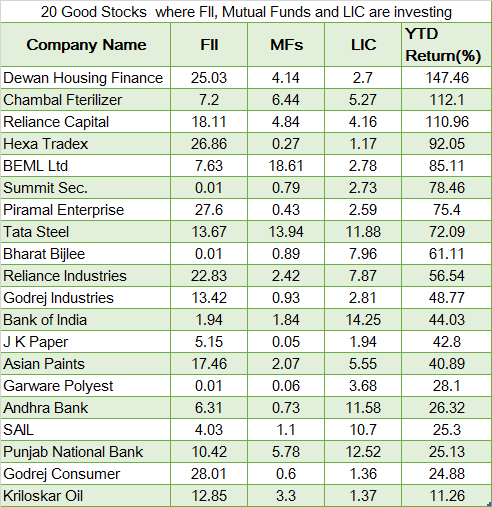 Following are 20 good stocks where FII, Mutual Funds, LIC are Investing. These stocks seems to be trustworthy FII, Mutual Funds and LIC all are investing in them. Out of above stocks Dewan Housing Finance rose by 147 percent, followed by Chambal Fertilisers which gained 112 percent, and Reliance Capital rose 110 percent in 2017. This is list as of the quarter ending June 2017. Also Read – Debt Free Companies In India – Good for Investment? Note – Above stocks are not recommendation of buying. It is shown here for the reference purpose only. How to identify good stocks for the investment? In order to identify good stocks for the investment, you must consider few parameters. I am not a stock market expert and I don’t have enough time to carry out research. Whenever I select a stock for investment, I consider following parameters. I know it may not be sufficient. However, I am managing my stock portfolio somehow and generating a decent return. Performance History – This is the first parameter I check when I decide to purchase a stock. I generally check last 5 years performance history (stock return), revenue growth and profit earned by the company. If company is consistently performing well, I go ahead and check another parameter. Zero or Very low debt – Second parameter of the consideration is zero or very low debt. Interest burden or stock makes it less profitable. Zero debt or low debt is very good sign for the company. Business Type and Competition – The next thing I consider is business type and competition. If company is maintaining monopoly with vast product range chance of getting return is very high. Valuation of stock – Once I identify business, I generally check for the valuation. To judge valuation I look at PE ratio of stock. If company is available with low P/E it means company stock is undervalued. I also look at EPS for the reference. In addition to above parameter I also keep eyes on sentimental news, or sector wise news. I prefer buying stock when stock market is down. I currently hold Maruti, L&T, Titan and Force Motors in my portfolio. Do you own any of the stock mentions above? Do you think above stocks will give positive returns in the future? Do you think above method of selection of stock is helpful to you?